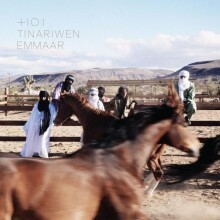 Tinariwen will be releasing their new album Emaar on February 11th, and the band has announced they will be returning to North America for a headlining tour in 2014. The tour begins March 13th with a performance at South by Southwest in Austin. I missed this group the last time they came to the U.S. and am going to try my best to check them out this time, as I’m really interested in hearing their music in person. Check out the full list of dates below. World renowned North African band Tinariwen will bring their electrifying and hypnotic guitar sound to venues across North America in 2014 when the group tours in support of their new album Emmaar which arrives in stores this February 11th. Included in the dates is the band’s first ever appearance at the SXSW Festival. Emmaar is the awaited follow up to Tinariwen’s acclaimed 2011 release Tassili which was recorded in the Algerian desert with an esteemed cadre of musicians including Wilco’s Nels Cline and TV on the Radio’s Tunde Adebimpe and Kyp Malone – the album won a Grammy for Best World Music. Along with the original members who founded the group in the 1980s (vocalists and guitarists Ibrahim Ag Alhabib, Abdallah Ag Alhousseyni, and Alhassane Ag Touhami) and the younger generation who grew up listening to the band and joined in the 1990s (multi-instrumentalist Eyadou Ag Leche, guitarist Elaga Ag Hamid, and percussionist Said Ag Ayad), a group of American musicians appear on the album. Accompanied by Red Hot Chili Peppers guitarist Josh Klinghoffer, Matt Sweeney from Chavez, Nashville fiddler Fats Kaplin, and poet Saul Williams, Emmaar (mixed by Vance Powell (Jack White, The Dead Weather) is a richly layered listen solidified by atmospheric textures and gritty guitar-work. The Wild Feathers Premiere New Video on CMT, New Album Out Aug!